Farber is an in-demand leadership expert, keynote speaker, and consultant who works with hundreds of clients around the world to inspire positive change and success in their organizations. Additionally, since 2004 Steve Farber has written 3 inspiring leadership books, listed below in chronological order. These bestselling, award-winning, critically acclaimed books on leadership put the principles of Extreme Leadership into easily understood terms and resonate with tens of thousands of readers. Steve Farber uses the art of language and storytelling in his business leadership books to stimulate the mind, engage the heart, and inspire action. Steve Farber’s business leadership books help readers put Extreme Leadership to practical use in their own lives–at work, at home, and in the community. Read more about each book and find links to purchase in the descriptions below. The Radical Leap: A Personal Lesson in Extreme Leadership is a business parable originally launched in 2004 and hailed as one of the 100 Best Business Books of All Time. In the last 10 years, the book has sold over 100,000 copies and inspires business leaders all over the world to bring Love, Energy, Audacity, and Proof to their work and their life. This 10th Anniversary edition contains a new self-assessment to help you gauge where to focus your personal Extreme Leadership development. 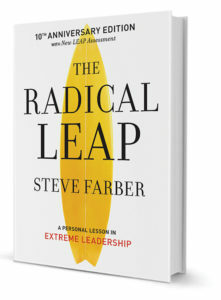 In his bestselling book The Radical Leap, Steve Farber introduced readers to Extreme Leadership, showing them how to renew their passion and excitement and become committed to changing the world for the better by disregarding normal constraints. 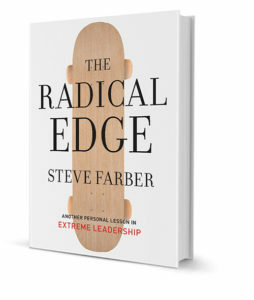 In this re-issue edition of The Radical Edge, Farber takes us to a new level of self-discovery. Re-energized from a recent transformational experience, Steve attempts to coach a young VP who has superstar sales skills but a severe and demoralizing leadership style. Along the way, a cast of provocative characters challenges us to stoke the fires of success, amplify personal joy, and change the world for the better—all at the same time. Too many people assume the timeless principles of true leadership—of helping others achieve their full potential—don’t apply Monday through Friday during work hours or in any circumstance where a paycheck is involved. 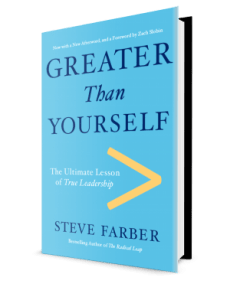 In GREATER THAN YOURSELF, Steve Farber proves them wrong: in this powerful and inspiring story, Farber shows that the goal of a genuine leader is to help others — teammates, employees, and colleagues—become more capable, confident, and accomplished than they are themselves. Through the actions of a forward-thinking and extraordinarily successful CEO, Farber reveals the three keys to achieving this: Expand Yourself, Give Yourself, and Replicate Yourself. 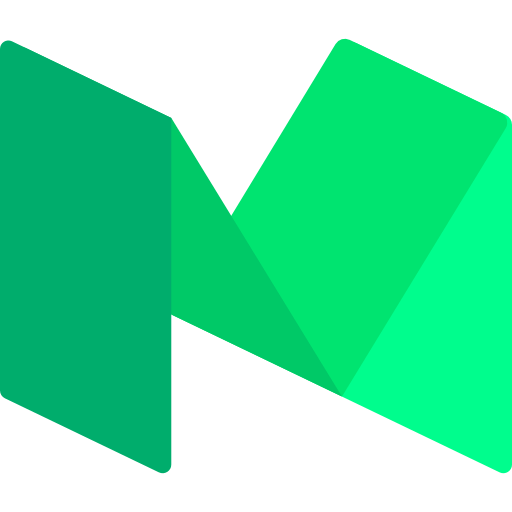 Filled with actionable principles and innovative ideas, GREATER THAN YOURSELF is perhaps the most powerful message today’s business leaders can learn. These leadership books have helped Steve Farber spread the message of Extreme Leadership, finding their way into corporate offices, non-profit organizations, schools, and more. These books on leadership make perfect gifts and reading material for promising entrepreneurs, company executives and managers, and anyone holding—or aspiring to hold–any kind of leadership role in their life, regardless of their current position or title. Since we all have the power to lead and inspire others, Steve Farber’s books about leadership can help anyone create positive change. 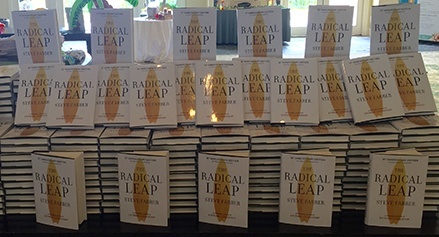 Note: Those who sign up for Extreme Leadership Certification receive a signed copy of both The Radical Leap and The Radical Edge.